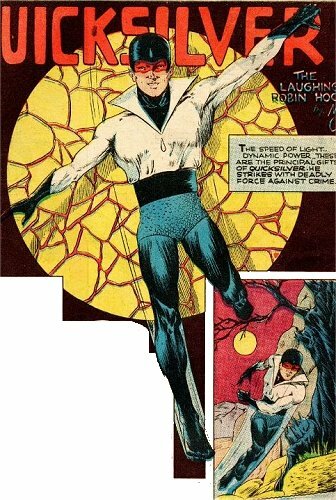 .That's Quicksilver, former acrobat turned crimefighter!" Comments: Quicksilver was never given an origin or secret identity while enjoying his Quality Comics run from National Comics #5 to #73. He had a "faithful young Chinese friend" Hoo Mee, who assisted him from time to time, providing "comic relief" for the strip - naturally, this being the 1940s, Hoo Mee was an embarrassing racial stereotype, being buck-toothed, clumsy and dimwitted, speaking broken English and being unable to pronounce the letter r.
When he was introduced under the new name Max Mercury (to avoid trademark issues with Marvel's more recent speedster also called Quicksilver) into the D.C. universe he became part of the supporting cast for the Flash, and then the mentor of teen speedster Impulse.